We previously characterized the CTL response of a melanoma patient who experienced tumor regression following vaccination with an ALVAC virus coding for a MAGE-A3 Ag. Whereas anti-vaccine CTL were rare in the blood and inside metastases of this patient, anti-tumor CTL recognizing other tumor Ags, mainly MAGE-C2, were 100 times more frequent in the blood and considerably enriched in metastases following vaccination. In this study we report the analysis of the CTL response of a second melanoma patient who showed a mixed tumor response after vaccination with dendritic cells pulsed with two MAGE-A3 antigenic peptides presented, respectively, by HLA-A1 and HLA-DP4. Anti-MAGE-3.A1 CD8 and anti-MAGE-3.DP4 CD4 T cells became detectable in the blood after vaccination at a frequency of ∼10−5 among the CD8 or CD4 T cells, respectively, and they were slightly enriched in slowly progressing metastases. Additional anti-tumor CTL were present in the blood at a frequency of 2 × 10−4 among the CD8 T cells and, among these, an anti-MAGE-C2 CTL clone was detected only following vaccination and was enriched by >1,000-fold in metastases relative to the blood. The striking similarity of these results with our previous observations further supports the hypothesis that the induction of a few anti-vaccine T cells may prime or restimulate additional anti-tumor T cell clones that are mainly responsible for the tumor regression. The molecular identification of the genes encoding tumor-specific Ags recognized by T cells has led to their use as therapeutic vaccines against cancer. However, when applied to metastatic melanoma patients with detectable tumors, these vaccinations with defined tumor Ags have to date produced only modest results in terms of clinical responses (1, 2, 3, 4, 5). We vaccinated such patients with MAGE-A3 Ags using various modalities such as the MAGE-A3168–176 peptide presented by HLA-A1 (MAGE-3.A1), the MAGE-A3 protein with adjuvant, and a recombinant ALVAC poxvirus coding for MAGE-3.A1 (6, 7, 8, 9). Of a total of 160 patients treated in these various studies, eight showed complete or partial clinical responses and 19 additional patients showed some evidence of tumor regression, usually mixed responses. An anti-vaccine T cell response was observed in most of the regressing patients vaccinated with ALVAC-MAGE-3.A1 or with dendritic cells (DC)4 pulsed with the MAGE-3.A1 peptide (10, 11). But the frequency of anti-vaccine CD8 T cells observed in the blood of these patients was usually <10−5 among the CD8 T cells. We wondered how such a very low number of anti-MAGE-A3 T cells could be responsible for tumor regression and examined the possibility that these T cells were highly concentrated within metastases. In the course of these studies, we also evaluated the total number of T cells present in the blood that were capable of being stimulated by autologous tumor cells and lysing these tumor cells. Such “anti-tumor” T cells were present in all metastatic melanoma patients at frequencies of ∼10−3, well above the frequencies of the anti-vaccine T cells (12). Moreover, we observed that these anti-tumor T cells were already present in the blood of these patients at similar frequencies before vaccination. We analyzed in detail the frequency of anti-tumor and anti-vaccine CD8 T cells in the blood and inside metastases of one of these patients. Patient EB81, who was vaccinated with ALVAC-MAGE-3.A1, showed regression of all skin metastases and underwent resection of an invaded lymph node (13). The frequency of anti-MAGE-3.A1 CD8 T cells in the blood was lower than 10−7 before immunization and rose to 2.5 × 10−6 (1/400,000) afterward. The anti-tumor CD8 T cells had a frequency of 3 × 10−4 in the blood before vaccination and 3 × 10−3 afterward. Most of the anti-tumor T cells observed after vaccination were directed against Ags that were not the vaccine Ag, many being encoded by the gene MAGE-C2, which belongs to the same cancer-germline gene family as MAGE-A3. When we examined the frequency of anti-MAGE-3.A1 CD8 T cells in tumor deposits resected after several vaccinations, we observed a frequency of ∼1.5 × 10−5, representing a modest 6-fold enrichment relative to frequency in the blood. As we observed that the ratio of intratumoral CD8 T cells to tumor cells was around 2%, we concluded that having >106 tumor cells for one anti-vaccine T cell made it almost inconceivable that the latter could be responsible on its own for the observed tumor rejection. In contrast, the anti-MAGE-C2 anti-tumor T cells showed a considerable enrichment in the tumor, with one clonotype constituting almost 10% of the CD8 T cells in the tumor. Altogether, the specific anti-tumor T cells accounted for at least 30% of the T cells present in the tumor. In the progressing metastasis that had been resected before vaccination, we also observed a significant enrichment of various anti-tumor T cell clonotypes, suggesting that the anti-tumor T cells present in the tumor before vaccination were in some state of anergy. Our working hypothesis to explain these observations is as follows: we believe that melanoma patients mount a spontaneous anti-tumor T cell response well before they are vaccinated and that at one point these lymphocytes become anergic. In regressing patients like EB81, following vaccination a small number of anti-vaccine T cells invade tumor locations, destroy some tumor cells, and thereby induce a focal reversion of the immunosuppressive tumor microenvironment. This enables the much more numerous anti-tumor T cells to become active. These cells then destroy the bulk of the tumor cells, resulting in tumor regression. Thus, the anti-vaccine T cells serve as a spark, inducing the stimulation of new clonotypes of anti-tumor T cells and possibly reawakening the anergic T cells that resulted from a previous response. We investigated whether the observations made on patient EB81 could be extended to other patients. In this article we report an analysis of the T cell response of another patient vaccinated with DC pulsed with MAGE-A3 peptides that supports the notion that the main component of the anti-tumoral T cells located in the tumor are not T cells directed against the vaccine but other anti-tumoral T cells. Melanoma patient LB2586 (HLA-A*0101, -A*2902, -B*2705, -B*4403, -Cw*0202, -Cw*1601, -DRB1*07, -DPB1*0401, -DQB1*0201/02, and -DQB1*0203) was included in a phase I/II study of autologous DC vaccination against the HLA-A1-restricted MAGE-A3 epitope conducted in the Department of Medical Oncology at the Universitair Ziekenhuis Brussel, Brussels, Belgium (protocol no. VUB-02-001). Patients were eligible if their tumor expressed the MAGE-A3 gene and if disease had a locoregional extension (T1-4N2b; TNM (tumor/lymph nodes/metastasis) staging system of the American Joint Committee on Cancer, Chicago, IL) and no visceral extension other than lung metastasis (M1b). The vaccine consisted of 10 million monocyte-derived autologous DC cultured for 6 days in the presence of GM-CSF and IL-4 and matured for 1 day in medium containing IL-4, GM-CSF, TNF-α, IL-6, IL-1β, and PGE2 (14). The HLA-A1-restricted MAGE-A3 peptide EVDPIGHLY168–176 (MAGE-3.A1) (15) was added for the last 8 h. Mature DC were collected and pulsed again for 3 h with the MAGE-3.A1 peptide and tetanus toxoid as the recall Ag. Injections were done in the upper left arm (50% intradermally and 50% s.c.) six times at 2-wk intervals. This protocol was approved by the Ethics Review Committee of the Universitair Ziekenhuis Brussel. For patient LB2586, the vaccine therapy was further extended. The patient received five additional cycles comprising six injections of MAGE-3.A1-peptide-pulsed DC. From vaccinations 10 to 21, the vaccine also included DC pulsed with the HLA-DP4-restricted MAGE-A3 peptide KKLLTQHFVQENYLEY243–258 (MAGE-3.DP4) (16). PBMC were collected regularly in the course of vaccination. Several skin metastases were surgically excised and used for the isolation of tumor-infiltrating lymphocytes (TIL) from fresh tissues, for analysis of the TCR gene rearrangements, or to establish a tumor cell line. Melanoma culture LB2586-MEL.B was obtained from a growing cutaneous metastasis resected after 12 injections (June 2003), and the LB2586-MEL.G cell line was derived from a growing cutaneous metastasis removed after 11 additional vaccinations (October 2004). These cultures were established according to the procedure described by Brasseur (17). Melanoma cell cultures, EBV-transformed B cells and the K562 cell line were cultured in IMDM (Invitrogen Life Technologies) supplemented with 10% FCS (Invitrogen Life Technologies). COS-7 cells were cultured in DMEM (Invitrogen Life Technologies) supplemented with 10% FCS. 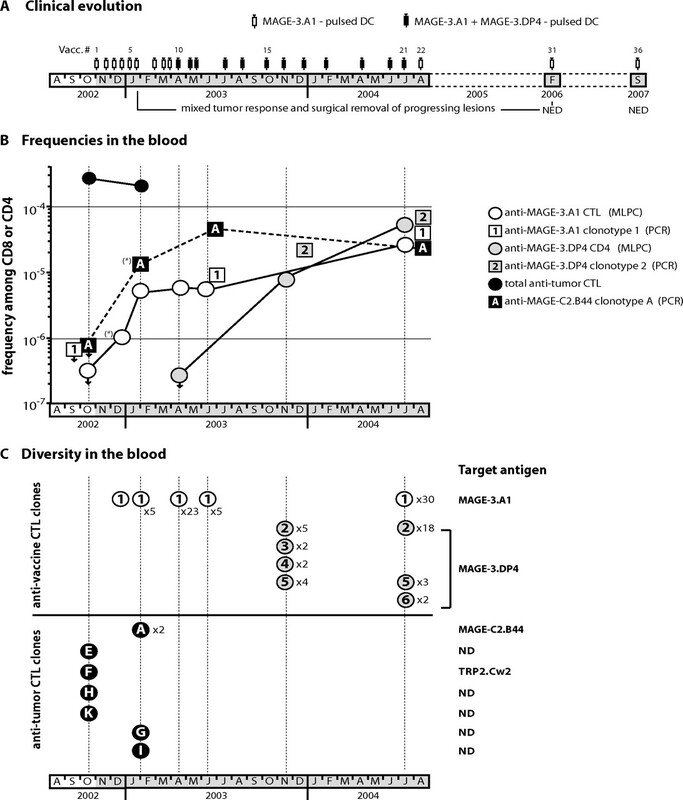 Mixed cultures of lymphocytes and cultures of CTL clones were performed in IMDM supplemented with 10% human serum instead of FCS and 5 × 10−5 M 2-ME. All media were supplemented with l-arginine (116 mg/L), l-asparagine (36 mg/L) and l-glutamine (216 mg/L). Expression of cancer-germline and melanocytic differentiation genes was assessed by reverse transcription and conventional PCR amplification (18, 19, 20, 21, 22, 23, 24). Anti-MAGE-3.A1 CD8 T cells were isolated from frozen PBMC either by in vitro mixed lymphocyte-peptide culture (MLPC) or by ex vivo sorting of MAGE-3.A1 tetramer-positive cells, as described previously (11). Anti-MAGE-3.DP4 CD4 T cells were isolated by ex vivo MAGE-3.DP4 multimer sorting as reported previously (25). Blood CD8 lymphocytes were purified from thawed PBMC with anti-CD8 magnetic beads on an autoMACS separator (Miltenyi Biotec). They were used to isolate anti-tumor CTL by mixed lymphocyte-tumor cell culture (MLTC) as described previously (26). Briefly, they were seeded at 200–6,000 cells/well and stimulated with autologous IFN-γ-treated LB2586-MEL.B tumor cells and IL-2 (50 U/ml) (Chiron), IL-4 (3 ng/ml) (produced in our laboratory), and IL-7 (10 ng/ml) (R&D Systems). They were restimulated under the same conditions on days 7 and 14. On day 21, aliquots collected from each microculture were used as effector cells in a cytotoxicity assay; lytic microcultures were used to derive anti-tumor CTL clones that were grown in the presence of irradiated IFN-γ-treated LB2586-MEL.B cells, irradiated allogeneic LG2-EBV-transformed B cells as feeder cells, and cytokines. Surgically resected cutaneous metastases were used as a source of TIL as described previously (26). To isolate anti-tumor CTL clones, we resorted to the same procedure as that used for analysis of blood anti-tumor T cells. Cytolytic activity was estimated in a chromium release assay as described previously (27). Briefly, CTL were mixed at various ratios with 1,000 51Cr-labeled target cells; after 4 h, the radioactivity released in the supernatant was measured. COS-7 cells were cotransfected using the Lipofectamine method (Invitrogen Life Technologies) with a combination of two different plasmids. The first contained one of a series of the patient’s HLA class I alleles and the second contained one of a series of cDNA encoding known tumor Ags. After 24 h, transfected cells were incubated with the appropriate resting CTL clone and its activation was detected by measuring TNF-α released in the supernatant, as described (26). TCR-α and -β gene rearrangements of the T cell clones were amplified by RT-PCR using panels of Vα- or Vβ-specific upstream primers (28) and one fluorescently labeled downstream primer (Cα-HEX or Cβ-NED) and analyzed using an ABI PRISM 3100 genetic analyzer equipped with the GeneScan software (Applied Biosystems). PCR products were purified and sequenced using the BigDye Terminator sequencing ready reaction kit (Applied Biosystems) and the ABI PRISM 3100 genetic analyzer to obtain a complete identification of the CDR3 region. A clonotypic detection procedure was set up for anti-MAGE-3.A1 CTL clone 1 (TCR α- and β-chains), anti-MAGE-3.DP4 CD4 T cell clone 2 (TCR β-chain), and anti-MAGE-C2.B44 CTL clone A (TCR α- and β-chains). For each of the three clonotypes we used two nested PCR amplifications followed by a run-off reaction. Accurate size determination of the runoff products was performed with the ABI PRISM 3100 genetic analyzer and GeneScan software (Applied Biosystems). For each clone, the sensitivity of the procedure was established by diluting its cDNA in cDNA from irrelevant PBMC as previously described (11). In the blood, frequency estimations were based on limiting dilution analysis, applying clonotypic PCR to cDNA prepared from multiple groups of 106 prevaccination or 104 to 2 × 105 postvaccination PBMC. The frequency of each T lymphocyte clone among either CD8 or CD4 T cells was estimated from the proportion of groups tested positive by clonotypic PCR (after correction for Poisson distribution), knowing the proportion of CD8 or CD4 T cells in PBMC as measured by flow cytometry. Total RNA was extracted with the RNeasy kit (Qiagen) from tumor samples resected before and after vaccination and frozen soon after resection. One microgram was reverse transcribed using PowerScript reverse transcriptase (Clontech) and 1 μM oligo(dT) primer in the presence of 1 μM SMART II oligonucleotide (Clontech). The number of TCR β-chain transcripts in these samples was estimated by quantitative PCR for the Cβ region. For each tumor sample, seven groups of ∼50 TCR β-chain transcripts were amplified by PCR with SMART and Cβ primers to get enough material for analyzing the diversity of TCR-β gene rearrangements inside each group with a panel of 24 Vβ sense primers (28) and a fluorescently labeled antisense inner Cβ primer. Accurate size determination of the PCR products was performed with the ABI PRISM 3100 Genetic Analyzer and the GeneScan software (Applied Biosystems). Using this approach we easily identified clonotypes assumed to be repeated, as PCR products of identical size and Vβ usage were found in independent groups of TCR-β. The actual sequence of TCR-β products from such repeated clonotypes were verified after cloning into the pcDNA3.1/V5/His-TOPO plasmid used to transform Escherichia coli TOP10 (TOPO-TA cloning kit; Invitrogen Life Technologies) and sequencing with the BigDye Terminator sequencing ready reaction kit (Applied Biosystems) and the ABI PRISM 3100 genetic analyzer to obtain a complete identification of the CDR3 region. This TCR-β screening was applied to samples of ∼300 TCR β-chains for each tumor sample. Consequently, only TCR-β gene rearrangements present at a frequency of ∼1% could be detected. To estimate frequencies below that level, clonotypic PCR for clonotypes 1, 2, and A (TCR β-chains) were applied on multiple fractions of 2 × 103-104 TCR β-chain transcripts of the same cDNA samples. Frequency estimations based on limiting dilution analysis were reported to the number of TCR β-chains that were analyzed. Patient LB2586 had a primary melanoma of the right foot resected in June 2000. In April 2002 a number of cutaneous metastases appeared on the right leg. There was no lymph node or visceral extension. Resected lesions showed expression of the gene MAGE-A3. Starting in November 2002, the patient received nine vaccinations with 10 million autologous mature DC pulsed with the MAGE-3.A1 peptide (Fig. 1⇓A). At that time, ∼13 metastases were present on the leg. From April 2003 until July 2004 (vaccinations 10–21), the patient received a mixture of DC pulsed with the MAGE-3.A1 peptide and DC pulsed with the MAGE-3.DP4 peptide. From August 2004 until September 2007, vaccinations 22–36 consisted of DC pulsed with the MAGE-3.A1 peptide alone. During the first six vaccinations, new lesions appeared and the existing lesions progressed, albeit slowly. In January 2003, a few of the 20 lesions present began to shrink but new ones appeared until August 2003, indicating a mixed tumor response (Fig. 2⇓). By February 2006, nine tumor nodules had regressed. The lesions that did not regress progressed slowly and were all removed by surgery. In February 2006 the patient was tumor free. In September 2007, the patient was still without evidence of disease, with an overall survival of five years after starting vaccination. Frequency and diversity of anti-vaccine and anti-tumor T cells in the blood of patient LB2586. A, Clinical evolution of the patient. NED, No evidence of disease. B, Frequencies of anti-vaccine and anti-tumor T cells. Circles refer to frequencies based on in vitro cultures (MLPC), squares refer to frequencies based on clonotypic PCR. All evaluations were conducted under limiting dilution conditions and details are given in Tables I and II. The asterisk (∗) indicates that the value is based on a single positive group in the limiting dilution analysis. The frequencies of anti-MAGE-3.A1 CTL and anti-tumor CTL are referred to total blood CD8 T cells, while the frequencies of anti-MAGE-3.DP4 T cells are referred to total blood CD4 T cells. C, Diversity of anti-vaccine (top panel) and anti-tumor (bottom panel) T cells. T cell clones derived from individual microcultures are represented with different numbers (anti-vaccine) or letters (anti-tumor) corresponding to different TCR sequences. The occurrence of repeated clones is also indicated. The target Ag is mentioned; for some clones, it was not determined (ND). Development of the mixed tumor response in patient LB2586. Regressing lesions on the posterior face of the right leg are encircled. The squares frame lesions that progressed over the same period of time. We examined the frequency of the anti-MAGE-3.A1 CTL in blood samples collected at various time points before and during the treatment by the MLPC approach. Groups of thawed PBMC were stimulated with the peptide under limiting dilution conditions. Two weeks later, wells containing CTL able to bind the MAGE-3.A1 tetramer were considered as positive (29). In the PBMC sample collected before vaccination, no positives were found among the 2.9 × 106 CD8 T cells that were tested, leading to a frequency of <3.4 × 10−7 (Fig. 1⇑B). Similar very low frequencies have been observed previously in noncancerous individuals (30). After vaccination, the frequency increased steadily, reaching a value of 5.6 × 10−6 after nine vaccinations. Fifteen months later, after 20 vaccinations, the frequency rose up to 2.8 × 10−5 of CD8 cells. It remained stable after six additional vaccinations, extending over an additional year (data not shown). To evaluate the diversity of this anti-vaccine CTL response, the sequence of the rearranged TCR-α and -β genes of independent anti-MAGE-3.A1 CTL clones derived from these blood samples were determined. Of 64 CTL clones examined, a single clonotype was found (referred below as clonotype 1) (Fig. 1⇑C). This monoclonal response was unexpected, because previous patients vaccinated with peptide-pulsed DC had shown a polyclonal response (11). The blood frequency of clonotype 1 was also evaluated ex vivo by clonotypic PCR with primers specific for the CDR3 region of the TCR-α and -β genes of clonotype 1. The PCR was applied to cDNA derived from freshly thawed, precisely enumerated groups of PBMC sized to apply the limiting dilution principle. The fraction of CD8 T cells in PBMC was estimated by flow cytometry. In PBMC collected before vaccination, the frequency of clonotype 1 was <8.3 × 10−7 of CD8 cells (Fig. 1⇑B). The frequency increased progressively to 7.5 × 10−6 of CD8 cells after 12 vaccinations. After nine additional vaccinations it reached 5.1 × 10−5. These clonotype frequencies were in good agreement with the frequencies of all anti-MAGE-3.A1 CTL obtained by the MLPC approach described above, which validates both series of measurements. We also examined whether specific CD4 T cells had been induced against the MAGE-3.DP4 Ag that was part of the vaccine from injections 10–21. These T cells were isolated from frozen PBMC by ex vivo MAGE-3.DP4 multimer sorting and cloning. Before adding the class II peptide to the vaccine, the frequency of the anti-MAGE-3.DP4 CD4 T cells was <3 × 10−7. It increased to 8 × 10−6 after six vaccinations including the MAGE-3.DP4 peptide and reached 5 × 10−5 after five additional vaccinations (Fig. 1⇑B). Analysis of the TCR α- and β-chains’ diversity indicated that this CD4 T cell response was oligoclonal, with one clonotype (clonotype 2) being clearly dominant as it was present in 18 of 23 CD4 T cell clones that were obtained after vaccination 20 (Fig. 1⇑C). The frequency of clonotype 2 in the blood was evaluated by clonotypic PCR at 2.5 × 10−5 of CD4 T cells after vaccination 16 and 6.6 × 10−5 after vaccination 21, again in agreement with the frequencies obtained by MLPC (Fig. 1⇑B). For all of these CD8 and CD4 frequencies we provide the precise number of lymphocytes tested and the frequencies estimated in Tables I⇓ and II⇓. It was possible to derive a melanoma cell culture from a progressive metastasis resected after 12 vaccinations. This LB2586-MEL.B cell culture presented a pattern of expression of cancer-germline and melanocytic differentiation genes reflecting the pattern of expression of cutaneous metastases (Table III⇓). We estimated the frequency of blood CTL capable of lysing the tumor cells. We stimulated groups of CD8 T cells sorted from PBMC with irradiated autologous tumor cells under limiting dilution conditions. After three weekly restimulations, microcultures that lysed autologous tumor cells but not autologous EBV-transformed B cells or the NK cell target K562 were considered to contain anti-tumor CTL. In a blood sample collected before vaccination, anti-tumor CTL were found at a frequency of 2.9 × 10−4 (Fig. 1⇑B). After six vaccinations, anti-tumor CTL were found at a similar frequency, i.e., two orders of magnitude higher than that of the anti-vaccine CTL at the same time point. Stable CTL clones were derived from microcultures that displayed a high level of anti-tumor lytic activity with the aim of establishing their diversity and identifying their target Ags. Four different anti-tumor CTL clones were derived from independent microcultures of CD8 T cells collected before vaccination (Fig. 1⇑C). We attempted to identify the Ags recognized by these CTL clones by coculturing them with COS-7 cells transiently cotransfected with plasmids containing cDNA of HLA molecules corresponding to the patient’s alleles together with the cDNA obtained from a set of genes known to encode tumor Ags. One of these CTL clones (clonotype F) recognized a melanocytic differentiation Ag encoded by TRP2/DCT and presented by HLA-Cw*0202, but the epitope was not further characterized due to the very poor growth of the CTL clone. The other three remained unidentified. Four CTL clones were derived from independent microcultures of CD8 T cells collected after six vaccinations. Two of them had the same clonotype, referred to below as clonotype A, which was found to recognize an epitope encoded by the cancer-germline gene MAGE-C2 and presented by HLA-B*4403, SESIKKKVL (26). The MLPC-tetramer approach could not be used to determine the blood frequency of this anti-MAGE-C2.B44 CTL A because the appropriate tetramer could not be produced. We therefore resorted to clonotypic PCR amplifications of the α and β-chains of the TCR of CTL A. Before vaccination, clonotype A frequency was <8.3 × 10−7 of CD8 T cells (Fig. 1⇑B and Table I⇑). Three months after the onset of vaccinations that frequency was raised to 1.5 × 10−5 and five months later to 4.2 × 10−5. We checked that the absence of an anti-MAGE-C2 response before vaccination was not due to the absence of expression of MAGE-C2 in the tumor. The metastases collected before and after vaccination expressed both MAGE-A3 and MAGE-C2 (Table III⇑). At three different time points in the course of the vaccination, surgically resected progressing lesions were used to prepare a single cell suspension and obtain TIL. After cloning these TIL and checking their tumor reactivity we set out to identify their target Ag specificity and their TCR sequences. Eighteen clones were isolated (Fig. 3⇓A). Among them, 10 recognized the same MAGE-C2.B44 epitope: eight clones belonged to clonotype A and two additional clones had a different TCR. The target of the eight remaining clones (of seven different clonotypes) could not be identified. Frequency and diversity of anti-vaccine and anti-tumor T cells in various skin metastases of patient LB2586. A, Diversity of anti-tumor T cells obtained from freshly prepared single cell suspensions from tumor fragments. TIL clones emerging from individual microcultures restimulated with tumor cells are referred to by different capital letters corresponding to different TCR sequences. The occurrence of repeated clones is indicated. The target Ag is mentioned; for some clones, it was not determined (ND). B, Frequency of anti-vaccine and anti-tumor TCR β-chains. Total RNA was extracted from fragments of resected frozen metastases and the total number of TCR β-chain transcripts was quantified. The frequencies of TCR β-chains of anti-vaccine clonotypes 1 and 2 and of anti-tumor clonotype A were evaluated among total TCR β-chains under limiting dilution conditions either by β-chain clonotypic PCR or by TCR-β screening. Values are given in Table II. The asterisk (∗) indicates that the value is based on a single positive group in the limiting dilution analysis. To get more insight into the frequency of selected T cell clones within tumors, RT-PCR-based approaches were used starting from frozen fragments of three slowly progressing metastases resected in the course of the vaccinations (Fig. 3⇑B). RNA was extracted from the frozen tumor fragments and reverse transcribed with an oligo(dT) primer in the presence of the SMART II oligonucleotide. The number of cDNA coding for TCR β-chains was estimated by quantitative PCR with Cβ primers. From each metastasis, seven aliquots of the cDNA corresponding to ∼50 Cβ molecules were amplified by PCR before TCR-β screening. We examined the frequency of the Vβ-chain of anti-MAGE-C2.B44 clonotype A amplified with a primer corresponding to the appropriate Vβ19 chain and a Cβ primer. Sequencing of the products indicated that clonotype A was found in many cDNA groups obtained from the three postvaccination metastases. Its frequency was estimated near to 1% of the TCR-β sequences (Fig. 3⇑B and Table II⇑). This frequency is >1,000 times higher than the frequency of clonotype A in the blood, suggesting a considerable enrichment of this CTL in the tumor. The analysis of the groups of cDNA amplified with primers corresponding to other Vβ-chains revealed that a total of 10 clonotypes were found at a frequency near to 1%, suggesting that several other anti-tumor T cells clones are considerably enriched in the tumor relative to the blood. We also examined the presence of the TCR β-chain of the anti-MAGE-3.A1 (clonotype 1) and the anti-MAGE-3.DP4 (clonotype 2) T cell clone in the three postvaccination metastases. To this end, the clonotypic PCR were applied on groups of larger aliquots (2 × 103-104) of TCR-β transcripts. As shown in Fig. 3⇑B and Table II⇑, the frequency reached 6.7 × 10−5 and 1.4 × 10−5, respectively, indicating little or no enrichment relative to the blood. The frequencies of these β-chains provide a maximum estimate of the presence of clonotype 1 and 2, as only the β-chain mRNA was assessed. Indeed, the coexistence of T lymphocytes expressing an identical β-chain but a different α-chain cannot be excluded, especially when considering low frequencies. This also applies to the very low frequencies of the β-chains of clonotypes 1, 2, and A observed in a prevaccination metastasis. These data strongly suggest that clonotypes 1, 2, and A were not involved in an anti-tumor response before vaccination. Patient LB2586 with a relapsing melanoma was vaccinated with autologous monocyte-derived mature DC pulsed with two MAGE-A3 peptides presented by HLA-A1 and HLA-DP4. The patient experienced a mixed clinical response with some skin metastases regressing while others were progressing, albeit at a relatively slow rate. Progressing metastases were surgically removed. In September 2007, the patient was still alive and disease-free nearly 5 years after the start of the treatment. We analyzed the T cell response of this patient, comparing the frequencies of T cells in the blood and at the tumor sites. We observed that: 1) CTL directed against tumor Ags were already present before vaccination at frequencies >10−4 among CD8 T cells; 2) upon vaccination, anti-MAGE-3.A1 CD8 T cells and anti-MAGE-3.DP4 CD4 T cells appeared at a low frequency, not exceeding 5 × 10−5 in the blood and showing little or no enrichment at tumor sites; and 3) the vaccination was associated with the activation of a new anti-tumor clonotype directed against a MAGE-C2 Ag (clonotype A), and these anti-tumor T cells were enriched >1,000-fold at tumor sites relative to the blood. Our observations strikingly resemble those presented earlier by our laboratory, analyzing the T cell response of melanoma patient EB81 who was vaccinated with a recombinant ALVAC-MAGE-3.A1 virus and who experienced a nearly complete regression (13). Similarities relate to the existence of an anti-tumor response already present before vaccination, to the weakness of the anti-vaccine response, and to the contrasting burst of an anti-tumor CTL response that is highly concentrated at tumor sites and again remarkably focused on Ags derived from MAGE-C2. The fact that anti-MAGE-C2 CTL (clonotype A) was found at tumor sites that were classified as slowly progressing but not regressing may cast some doubt on the ability of this new wave of CTL to destroy tumor cells. However, in patient EB81 new waves of anti-tumor CTL were observed in regressing as well as progressing metastases. These observations suggest that the clinical classification of tumor lesions between progressing, stable, or regressing metastasis is a simplification that does not consider the heterogeneity within each tumor site. One could hypothesize that anti-tumor CTL recognize and eliminate tumor cells not only in regressing but also in progressing lesions, although in a lower proportion in the latter. In the present study, patient LB2586 was first vaccinated with a class I MAGE-3.A1 Ag. After nine vaccinations, the patient received an additional class II MAGE-3.DP4 Ag. The T cell response against the class II epitope was of the same order of magnitude as the T cell response against the class I epitope in the blood and did not concentrate in the tumor either. 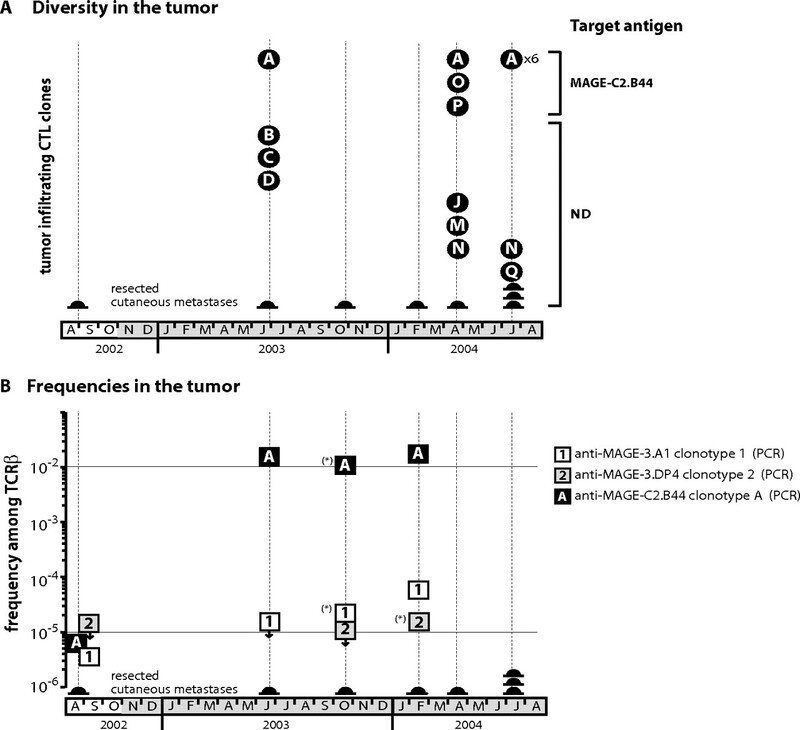 There is no indication that the addition of the class II peptide influenced the course of events, as tumor regressions and the emergence of anti-MAGE-C2.B44 clonotype A were initiated before the addition of the class II peptide. Taken together, the data related to the response of patient LB2586 support the scenario proposed after the analysis of the response of patient EB81: anti-vaccine T cells are not numerous enough to be the effectors able to destroy the tumor mass but somehow they trigger the massive production of anti-tumor T cells potentially able to proceed to tumor eradication (13, 31). We are presently investigating whether or not this process occurred in patients who did not respond to vaccination. The occurrence of T cell responses directed against other antigenic determinants than those targeted by a vaccine or by adoptive T cell transfer is a phenomenon commonly referred to as epitope spreading. The classical example was experimental encephalomyelitis, where priming mice with one myelin antigenic peptide produced not only T cells that reacted against this peptide but others that recognized different determinants of the same protein and other myelin Ags (32). Epitope spreading is presumably due to the fact that the recognition of one Ag on a target cell by T cells generates conditions such as cytokine release and target cell destruction that facilitate the presentation of other Ags present on the target cells. This mechanism was probably the basis for the observation that tum− variants, i.e., immunogenic variants obtained from mouse tumors, could trigger a T cell response against a tumor Ag of the original tumor even though this tumor was absolutely nonimmunogenic (33). More recently, Markievicz et al. (34) observed that the immunization of mice against epitope P1A of mastocytoma P815, followed by rejection of a P1A+ tumor, subsequently yielded CTL activity against epitope P1E and protection against a P1A−P1E+ tumor variant. Lally et al. (35) documented the surfacing of the immune reactivity of circulating lymphocytes toward an epitope of the MAGE-12 gene after the vaccination of a melanoma patient with a gp100 epitope that resulted in a temporary regression of a single metastasis. Determinant spreading was suggested by Butterfield et al. to be associated with clinical response (36, 37). In one patient vaccinated with DC pulsed with a MART-1/Melan-A epitope who showed a complete response, they observed in an ELISPOT assay an increase in the frequency of T cells directed against gp100 and tyrosinase, but this increase was <4-fold. Vignard et al. (38) observed that after the adoptive transfer of tumor-reactive Melan-A-specific CTL new expanded clonotypes appeared, suggesting that infused CTL clones may have initiated an anti-tumor response resulting in the expansion of a Melan-A-specific repertoire. Our data are in line with the concept of epitope spreading. But they go beyond it, as the response against the vaccine Ag remains small and triggers a burst of T cells that are directed against other tumor Ags and that accumulate at tumor sites. In this scenario, the magnitude of the T cell response against the vaccine is not the limiting factor of therapeutic anti-cancer vaccination. The limiting factors may be the ability of the anti-vaccine T cells to reach the tumor and their ability to initiate some tumor cell killing despite the immunosuppressive environment of the tumor, or the capacity of this killing to overcome the local immunosuppression and trigger a massive response against other tumor Ags. Because of pioneering work conducted on the immunotherapy of patients with metastatic melanoma, it is clearly established that tumor sites are infiltrated by TIL (39). However, tumors progress under those circumstances, suggesting that tumor resistance downstream from T cell priming is at play. Many mechanisms may be involved, i.e., the activity of nutrient-catabolizing enzymes such as IDO or arginase, the expression of inhibitory ligands such as PD-L1, and the influence of CD4+CD25+ regulatory T cells (40). Understanding how, in some cases, anti-vaccine T cells are able to reverse such immunosuppressive processes so as to either restore the functionality of preexisting CTL clones or prime new clones may be the major challenge of immunotherapy. We thank Jürgen Corthals and Jerôme Degueldre for samples and data managing, Vinh Ha Thi, Maria Panagiotakopoulos, and Magdalena Swinarska for technical assistance, and André Tonon for expertise with the FACS. We thank Nathalie Krack and Julie Klein for editorial assistance. We thank Pierre Coulie for critical reading of the manuscript. ↵1 This work was supported by grants from the Fédération Belge contre le Cancer (Belgium), the Fonds de la Recherche Scientifique Médicale (Belgium), and the Fonds National de la Recherche Scientifique (Belgium). J.C. was supported by a Télévie Grant from the Fonds National de la Recherche Scientifique (Belgium), and N.R. was supported by a fellowship obtained from the Marie Curie Organization. ↵2 Current address: Hôpitaux Saint-Joseph, Sainte-Thérèse and Institut de Médecine, Traumatologie et Réadaptation, Department of Medicine-Oncology, Rue de la Duchère 6, B-6060 Gilly, Belgium. ↵4 Abbreviations used in this paper: DC, dendritic cell; MLPC, mixed lymphocyte-peptide culture; TIL, tumor-infiltrating lymphocyte. Gajewski, T. F., F. Fallarino, A. Ashikari, M. Sherman. 2001. Immunization of HLA-A2+ melanoma patients with MAGE-3 or MelanA peptide-pulsed autologous peripheral blood mononuclear cells plus recombinant human interleukin 12. Clin. Cancer Res. 7: 895s-901s. Slingluff, C. L., Jr, G. R. Petroni, G. V. Yamshchikov, D. L. Barnd, S. Eastham, H. Galavotti, J. W. Patterson, D. H. Deacon, S. Hibbitts, D. Teates, et al 2003. Clinical and immunologic results of a randomized phase II trial of vaccination using four melanoma peptides either administered in granulocyte-macrophage colony-stimulating factor in adjuvant or pulsed on dendritic cells. J. Clin. Oncol. 21: 4016-4026. Slingluff, C. L., Jr, G. R. Petroni, G. V. Yamshchikov, S. Hibbitts, W. W. Grosh, K. A. Chianese-Bullock, E. A. Bissonette, D. L. Barnd, D. H. Deacon, J. W. Patterson, et al 2004. Immunologic and clinical outcomes of vaccination with a multiepitope melanoma peptide vaccine plus low-dose interleukin-2 administered either concurrently or on a delayed schedule. J. Clin. Oncol. 22: 4474-4485. Mitchell, M. S., W. Harel, R. A. Kempf, E. Hu, J. Kan-Mitchell, W. D. Boswell, G. Dean, L. Stevenson. 1990. Active-specific immunotherapy for melanoma. J. Clin. Oncol. 8: 856-869. Marchand, M., N. van Baren, P. Weynants, V. Brichard, B. Dréno, M.-H. Tessier, E. Rankin, G. Parmiani, F. Arienti, Y. Humblet, et al 1999. Tumor regressions observed in patients with metastatic melanoma treated with an antigenic peptide encoded by gene MAGE-3 and presented by HLA-A1. Int. J. Cancer 80: 219-230. Marchand, M., C. J. A. Punt, S. Aamdal, B. Escudier, W. H. J. Kruit, U. Keilholz, L. Håkansson, N. van Baren, Y. Humblet, P. Mulders, et al 2003. Immunization of metastatic cancer patients with MAGE-3 protein combined with adjuvant SBAS-2: clinical report. Eur. J. Cancer 39: 70-77. Kruit, W. H., H. H. van Ojik, V. G. Brichard, B. Escudier, T. Dorval, B. Dréno, P. Patel, N. van Baren, M.-F. Avril, S. Piperno, et al 2005. Phase 1/2 study of subcutaneous and intradermal immunization with a recombinant MAGE-3 protein in patients with detectable metastatic melanoma. Int. J. Cancer 117: 596-604.
van Baren, N., M.-C. Bonnet, B. Dréno, A. Khammari, T. Dorval, S. Piperno-Neumann, D. Liénard, D. Speiser, M. Marchand, V. G. Brichard, et al 2005. Tumoral and immunologic response after vaccination of melanoma patients with an ALVAC virus encoding MAGE antigens recognized by T cells. J. Clin. Oncol. 23: 9008-9021. Thurner, B., I. Haendle, C. Roder, D. Dieckmann, P. Keikavoussi, H. Jonuleit, A. Bender, C. Maczek, D. Schreiner, P. von den Driesch, et al 1999. Vaccination with MAGE-3A1 peptide-pulsed mature, monocyte-derived dendritic cells expands specific cytotoxic T cells and induces regression of some metastases in advanced stage IV melanoma. J. Exp. Med. 190: 1669-1678. Godelaine, D., J. Carrasco, S. Lucas, V. Karanikas, B. Schuler-Thurner, P. G. Coulie, G. Schuler, T. Boon, A. Van Pel. 2003. Polyclonal CTL responses observed in melanoma patients vaccinated with dendritic cells pulsed with a MAGE-3.A1 peptide. J. Immunol. 171: 4893-4897. Germeau, C., W. Ma, F. Schiavetti, C. Lurquin, E. Henry, N. Vigneron, F. Brasseur, B. Lethé, E. De Plaen, T. Velu, et al 2005. High frequency of anti-tumor T cells in the blood of melanoma patients before and after vaccination with tumor antigens. J. Exp. Med. 201: 241-248. Lurquin, C., B. Lethé, V. Corbière, I. Théate, N. van Baren, P. G. Coulie, T. Boon. 2005. Contrasting frequencies of anti-tumor and anti-vaccine T cells in metastases of a melanoma patient vaccinated with a MAGE tumor antigen. J. Exp. Med. 201: 249-257. Tuyaerts, S., S. M. Noppe, J. Corthals, K. Breckpot, C. Heirman, C. De Greef, I. Van Riet, K. Thielemans. 2002. Generation of large numbers of dendritic cells in a closed system using cell factories. J. Immunol. Methods 264: 135-151. Gaugler, B., B. Van den Eynde, P. van der Bruggen, P. Romero, J. J. Gaforio, E. De Plaen, B. Lethé, F. Brasseur, T. Boon. 1994. Human gene MAGE-3 codes for an antigen recognized on a melanoma by autologous cytolytic T lymphocytes. J. Exp. Med. 179: 921-930. Schultz, E. S., B. Lethé, C. L. Cambiaso, J. Van Snick, P. Chaux, J. Corthals, C. Heirman, K. Thielemans, T. Boon, P. van der Bruggen. 2000. A MAGE-A3 peptide presented by HLA-DP4 is recognized on tumor cells by CD4+ cytolytic T lymphocytes. Cancer Res. 60: 6272-6275. Brasseur, F.. 1999. Melanoma: Brussels melanoma cell lines. J. R. W. Masters, Jr, and B. Palsson, Jr, eds. In Human Cell Culture Vol. 1: 275-282. Kluwer Academic Publishers, Dordrecht. De Plaen, E., K. Arden, C. Traversari, J. J. Gaforio, J.-P. Szikora, C. De Smet, F. Brasseur, P. van der Bruggen, B. Lethé, C. Lurquin, et al 1994. Structure, chromosomal localization, and expression of twelve genes of the MAGE family. Immunogenetics 40: 360-369. Lucas, S., E. De Plaen, T. Boon. 2000. MAGE-B5, MAGE-B6, MAGE-C2 and MAGE-C3: four new members of the MAGE family with tumor-specific expression. Int. J. Cancer 87: 55-60. Lethé, B., S. Lucas, L. Michaux, C. De Smet, D. Godelaine, A. Serrano, E. De Plaen, T. Boon. 1998. LAGE-1, a new gene with tumor specificity. Int. J. Cancer 76: 903-908. Guilloux, Y., S. Lucas, V. G. Brichard, A. Van Pel, C. Viret, E. De Plaen, F. Brasseur, B. Lethé, F. Jotereau, T. Boon. 1996. A peptide recognized by human cytolytic T lymphocytes on HLA-A2 melanomas is encoded by an intron sequence of the N-acetylglucosaminyltransferase V gene. J. Exp. Med. 183: 1173-1183. Brichard, V. G., J. Herman, A. Van Pel, C. Wildmann, B. Gaugler, T. Wölfel, T. Boon, B. Lethé. 1996. A tyrosinase nonapeptide presented by HLA-B44 is recognized on a human melanoma by autologous cytolytic T lymphocytes. Eur. J. Immunol. 26: 224-230. Brasseur, F., D. Rimoldi, D. Liénard, B. Lethé, S. Carrel, F. Arienti, L. Suter, R. Vanwijck, A. Bourlond, Y. Humblet, et al 1995. Expression of MAGE genes in primary and metastatic cutaneous melanoma. Int. J. Cancer 63: 375-380. Jäger, E., M. Ringhoffer, H. P. Dienes, M. Arand, J. Karbach, D. Jager, C. Ilsemann, M. Hagedorn, F. Oesch, A. Knuth. 1996. Granulocyte-macrophage-colony-stimulating factor enhances immune responses to melanoma-associated peptides in vivo. Int. J. Cancer 67: 54-62. Zhang, Y., N. Renkvist, Z. Sun, B. Schuler-Thurner, N. Glaichenhaus, G. Schuler, T. Boon, P. van der Bruggen, D. Colau. 2005. A polyclonal anti-vaccine CD4 T cell response detected with HLA-DP4 multimers in a melanoma patient vaccinated with MAGE-3.DP4 peptide-pulsed dendritic cells. Eur. J. Immunol. 35: 1066-1075. Godelaine, D., J. Carrasco, F. Brasseur, B. Neyns, K. Thielemans, T. Boon, A. Van Pel. 2007. A new tumor-specific antigen encoded by MAGE-C2 and presented to cytolytic T lymphocytes by HLA-B44. Cancer Immunol. Immunother. 56: 753-759. Boon, T., J. Van Snick, A. Van Pel, C. Uyttenhove, M. Marchand. 1980. Immunogenic variants obtained by mutagenesis of mouse mastocytoma P815: II. T lymphocyte-mediated cytolysis. J. Exp. Med. 152: 1184-1193. Genevée, C., A. Diu, J. Nierat, A. Caignard, P. Y. Dietrich, L. Ferradini, S. Roman-Roman, F. Triebel, T. Hercend. 1992. An experimentally validated panel of subfamily-specific oligonucleotide primers (Vα1-w29/Vβ1-w24) for the study of human T cell receptor variable V gene segment usage by polymerase chain reaction. Eur. J. Immunol. 22: 1261-1269. Coulie, P. G., V. Karanikas, D. Colau, C. Lurquin, C. Landry, M. Marchand, T. Dorval, V. Brichard, T. Boon. 2001. A monoclonal cytolytic T-lymphocyte response observed in a melanoma patient vaccinated with a tumor-specific antigenic peptide encoded by gene MAGE-3. Proc. Natl. Acad. Sci. USA 98: 10290-10295. Lonchay, C., P. van der Bruggen, T. Connerotte, T. Hanagiri, P. Coulie, D. Colau, S. Lucas, A. Van Pel, K. Thielemans, N. van Baren, T. Boon. 2004. Correlation between tumor regression and T cell responses in melanoma patients vaccinated with a MAGE antigen. Proc. Natl. Acad. Sci. USA 101: 14631-14638. Boon, T., P. G. Coulie, B. Van den Eynde, P. van der Bruggen. 2006. Human T cell responses against melanoma. Annu. Rev. Immunol. 24: 175-208. McRae, B. L., C. L. Vanderlugt, M. C. Dal Canto, S. D. Miller. 1995. Functional evidence for epitope spreading in the relapsing pathology of experimental autoimmune encephalomyelitis. J. Exp. Med. 182: 75-85. Boon, T., A. Van Pel. 1978. Teratocarcinoma cell variants rejected by syngeneic mice: protection of mice immunized with these variants against other variants and against the original malignant cell line. Proc. Natl. Acad. Sci. USA 75: 1519-1523. Markiewicz, M. A., F. Fallarino, A. Ashikari, T. F. Gajewski. 2001. Epitope spreading upon P815 tumor rejection triggered by vaccination with the single class I MHC-restricted peptide P1A. Int. Immunol. 13: 625-632. Lally, K. M., S. Mocellin, G. A. Ohnmacht, M. B. Nielsen, M. Bettinotti, M. C. Panelli, V. Monsurro, F. M. Marincola. 2001. Unmasking cryptic epitopes after loss of immunodominant tumor antigen expression through epitope spreading. Int. J. Cancer 93: 841-847. Butterfield, L. H., A. Ribas, V. B. Dissette, S. N. Amarnani, H. T. Vu, D. Oseguera, H.-J. Wang, R. M. Elashoff, W. H. McBride, B. Mukherji, et al 2003. Determinant spreading associated with clinical response in dendritic cell-based immunotherapy for malignant melanoma. Clin. Cancer Res. 9: 998-1008. Ribas, A., J. M. Timmerman, L. H. Butterfield, J. S. Economou. 2003. Determinant spreading and tumor responses after peptide-based cancer immunotherapy. Trends Immunol. 24: 58-61. Vignard, V., B. Lemercier, A. Lim, M. C. Pandolfino, Y. Guilloux, A. Khammari, C. Rabu, K. Echasserieau, F. Lang, M. L. Gougeon, et al 2005. Adoptive transfer of tumor-reactive Melan-A-specific CTL clones in melanoma patients is followed by increased frequencies of additional Melan-A-specific T cells. J. Immunol. 175: 4797-4805. Rosenberg, S. A., B. S. Packard, P. M. Aebersold, D. Solomon, S. L. Topalian, S. T. Toy, P. Simon, M. T. Lotze, J. C. Yang, C. A. Seipp, et al 1988. Use of tumor-infiltrating lymphocytes and interleukin-2 in the immunotherapy of patients with metastatic melanoma. New Engl. J. Med. 319: 1676-1680. Gajewski, T. F., Y. Meng, C. Blank, I. Brown, A. Kacha, J. Kline, H. Harlin. 2006. Immune resistance orchestrated by the tumor microenvironment. Immunol. Rev. 213: 131-145.